With about 1 million inhabitants, Bilbao (in Basque also Bilbo) is the largest metropolitan area in the Basque Country (Northern Spain) (including towns like Portugalete, Sestao, Getxo, Barakaldo). The metropolitan area spreads out along both sides of the river Nervión and the Ría de Bilbao, suggesting a Y-shaped metro system. 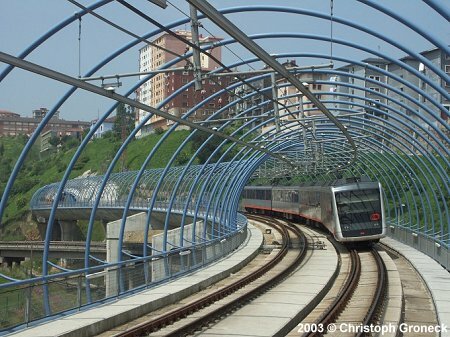 On 11 November 1995, Line 1 opened from Casco Viejo to Plentzia, using existing suburban surface tracks formerly served by the Basque Railways (EuskoTrenbideak) between Lutxana and Plentzia. A new tunnel was built between Lutxana and Casco Viejo (Old Town) through the city centre. 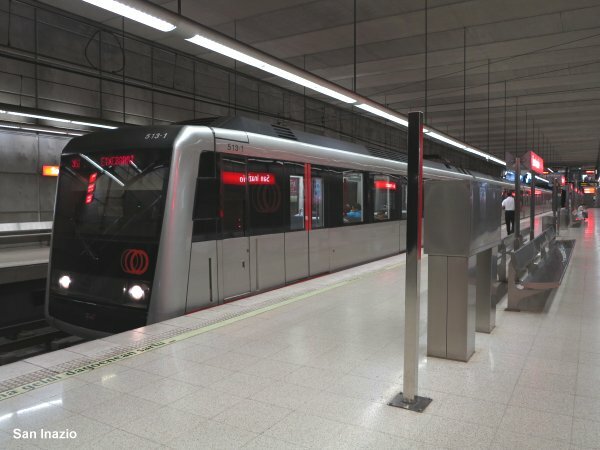 Metro Bilbao therefore uses metre-gauge. The second section, Casco Viejo - Bolueta, was taken into service in July 1997. 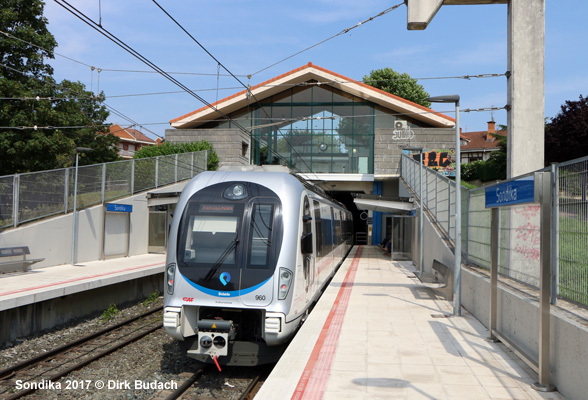 At Bolueta, the Metro line connects directly to EuskoTren's suburban service towards Bermeo and Eibar. 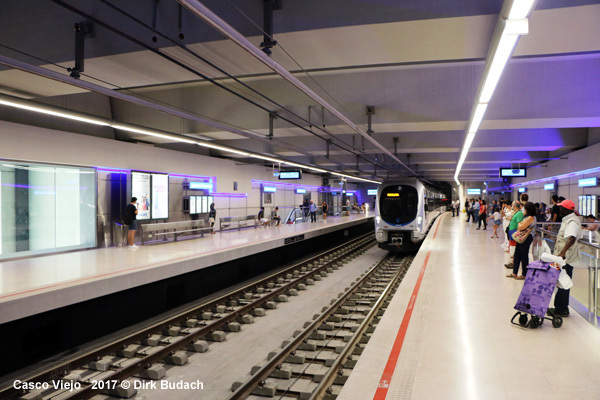 Line 1 now starts at Etxebarri, then serves the elevated station at Bolueta (on top of EuskoTren's station), before entering the tunnel through the city centre and crossing the river Nervión twice in a tunnel (between Casco Viejo and Abando and between San Mamés and Deusto). At San Inazio (a three-track station - two separate tracks with a central platform for inbound line 1 and line 2 trains), the trunk route splits into two branches. Line 1 comes up to the surface and runs along the former suburban line through industrial zones (serving Erandio in a tunnel station). 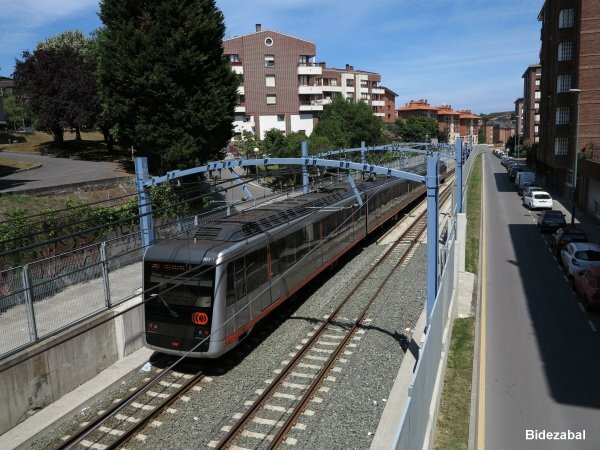 In Areeta (Las Arenas) the line goes underground again for 1 km and after that it runs mainly on an elevated structure through the nice residential area of Getxo (Algorta also in tunnel) to Bidezabal. North of Bidezabal, a short section was put underground in 2012 to eliminate one of the last level crossings on the old line. Beyond Bidezabal, the environment gets more rural. 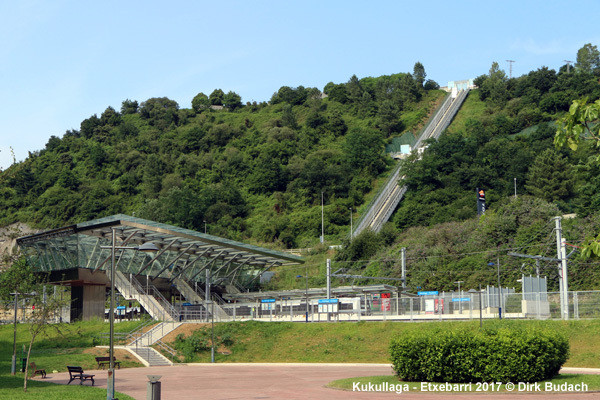 By April 2017, another short section had been put underground including Urduliz station; from here, the line is single-track and runs down to Plentzia by the sea through nice woodlands. Construction work for Line 2 began in 1997. 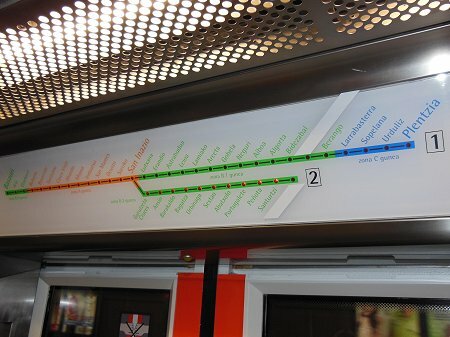 This line shares tracks with Line 1 between Etxebarri and San Inazio. The first new 5.8 km stretch from San Inazio to Urbinaga opened on 13 April 2002. 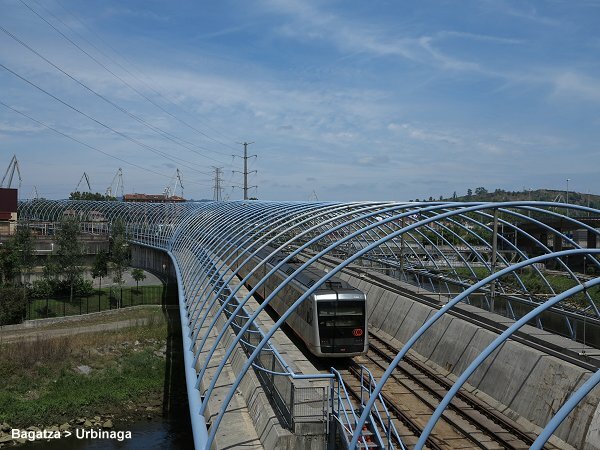 This line is almost totally underground, just at Urbinaga, an elevated structure was built across the Galindo Valley; at Urbinaga, a transfer station to Renfe's Santurtzi and Muskiz services was planned, but did not materialise. 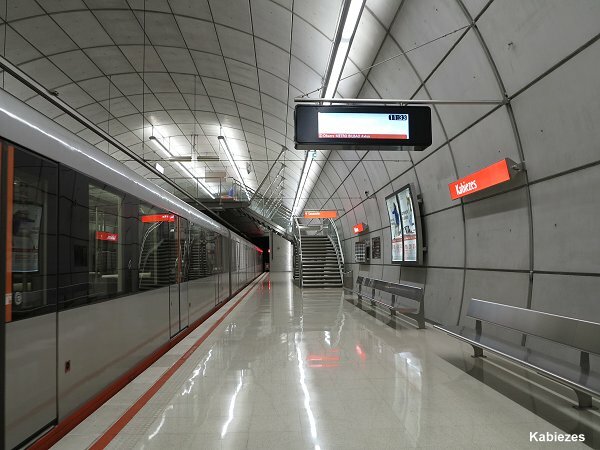 In various stages, Line 2 reached Basauri in 2011 and Kabiezes in mid-2014. 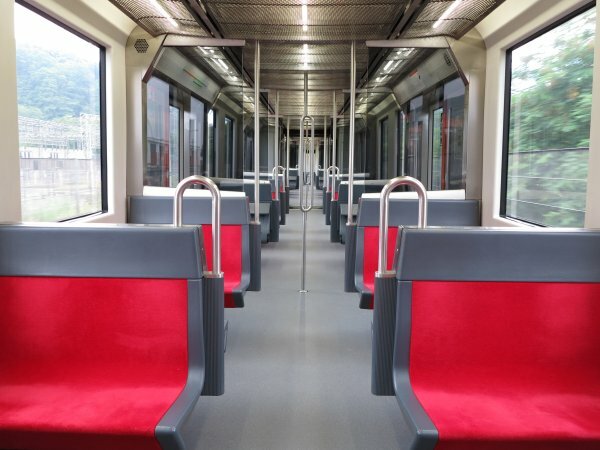 Trains for the Bilbao Metro were made by CAF (a company located in the Basque Country), and are equipped with air conditioning, accoustic and visual station announcement. Cars are of the modern walk-through type. Although narrow gauge (1000 mm) is used, trains are still 2.8 m wide. 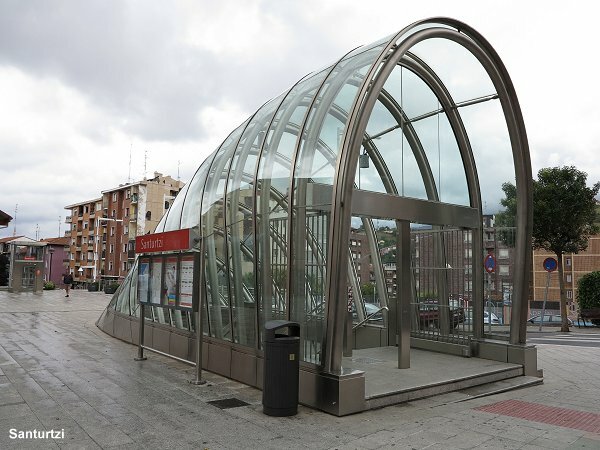 Stations were designed by Norman Foster, with all underground stations being identical (except Sarriko, San Inazio and Ansio - as well as those on the older section between Erandio and Algorta). 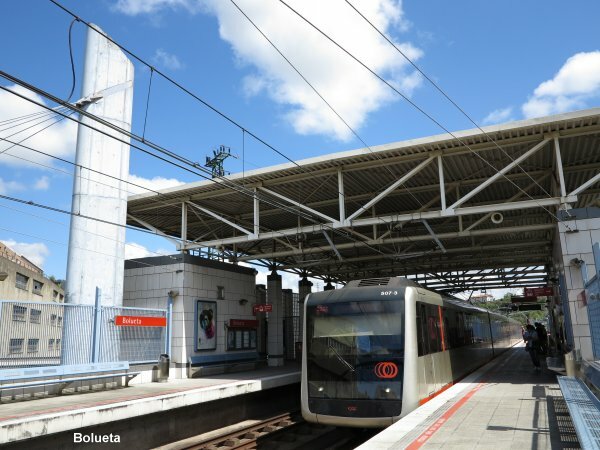 All the stations are fully accessible with lifts, and escalators usually are also installed between vestibule and street level, but not down to the platforms (which can be a bit annoying at Abando (Railway Station) where the lift doesn't take you directly to the railway station complex! 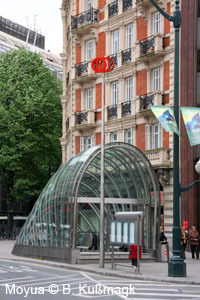 From the street, most stations are accessed through "Fosteritos", typical glass entrances named after the architect. 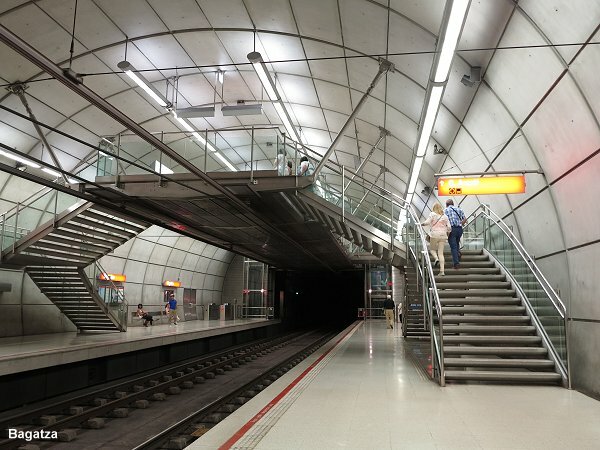 Casco Viejo station is situated in the mountain and can be accessed almost at grade from the central Plaza Miguel de Unamuno or via a lift from the top of the mountain Begoña. 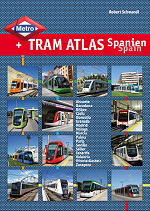 In June 2014, Line 1 runs from Plentzia to Etxebarri (29.5 km), and Line 2 from Kabiezes to Basauri (23.1 km). 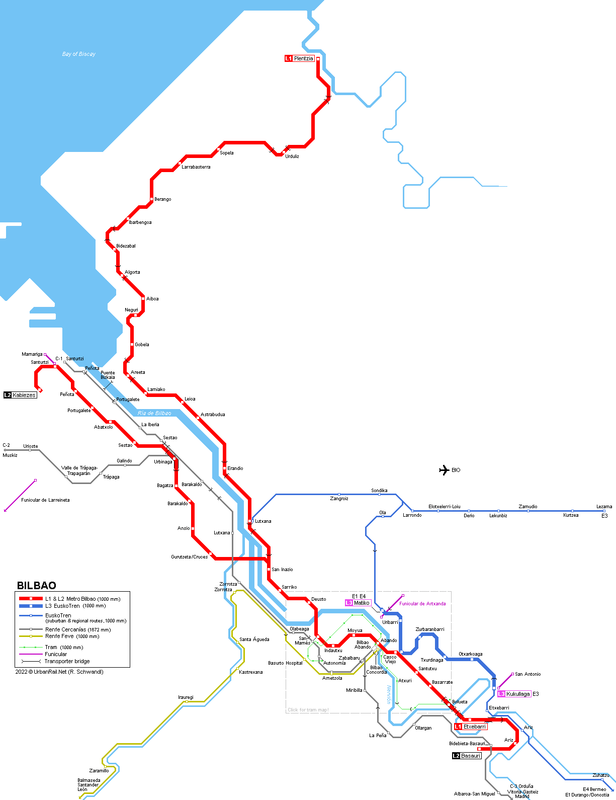 Total length of the network is 43.5 km with 41 stations. Line 3 runs from Kukullaga (San Antonio de Etxebarri) to Matiko - 5.9 km with five intermediate stations: Otxarkoaga, Txurdinaga, Zurbaranbarri, Zazpikaleak/Casco Viejo (interchange with L1/L2) and Uribarri. 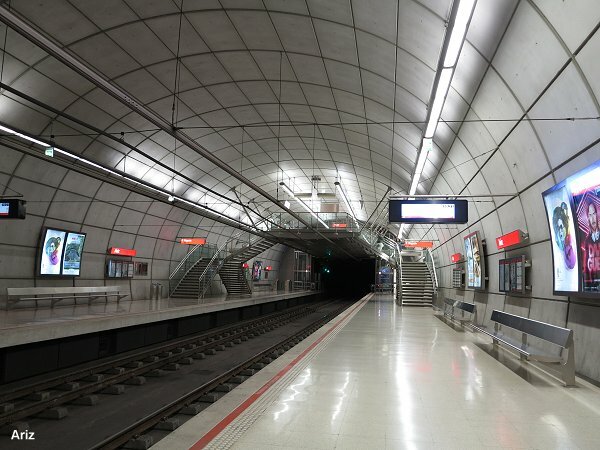 The section between Zazpikaleak/Casco Viejo and Matiko was taken over from a former EuskoTren line (Casco Viejo - Deustu closed 10-05-2010) - it was rebuilt and connected to a new double-track tunnel (1.9 km) beneath the Artxanda mountain to Ola, so that every other L3 train continues to Lezama as line E3. 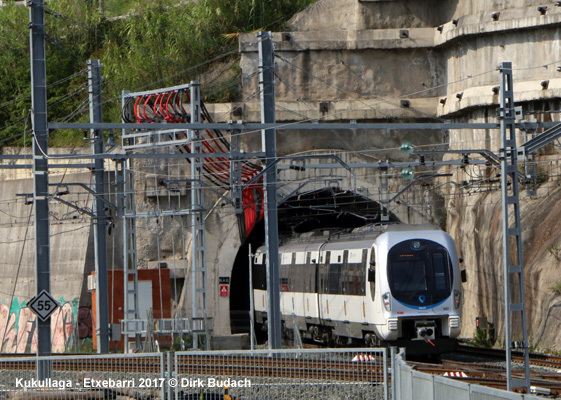 On 19 June 2017, also trains from Durango and Donostia/San Sebastián started to run through the L3 tunnel, terminating at Matiko. 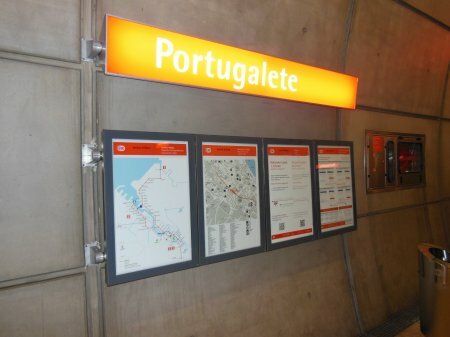 Except for the termini Matiko and Kukullaga, all L3 stations follow the standard design developed by Norman Foster for metro lines L1 and L2, but instead of the typical red signs, these feature blue EuskoTren signage. The class 950 trains used on L3 were manufactured by CAF and consist of three cars, with the option of adding a fourth car if necessary. 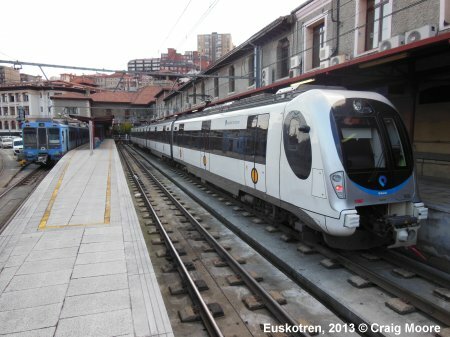 EuskoTren's main line starts at Atxuri and runs via a new transfer station with Metro at Bolueta out to Lemoa (15-minute headway) where the line splits into a branch to Gernika / Bermeo and another one to Durango / Eibar (both branches served every 30 minutes). 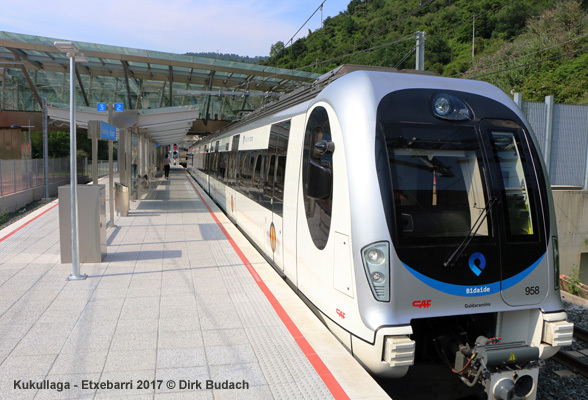 In a next stage, E1 and E4 trains from Bermeo and Donostia/San Sebastián will also be directly linked to metro line L3 at Kukullaga, while the existing EuskoTren route to Atxuri will be converted into a tram line. 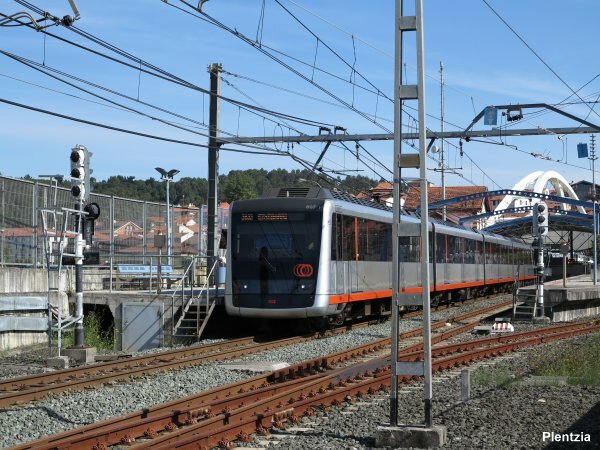 On Line 1, a new station has been added between Bidezabal and Berango, called Ibarbengoa-Getxo, but it has lain idle for some years now due to cancelled development in the area around it. 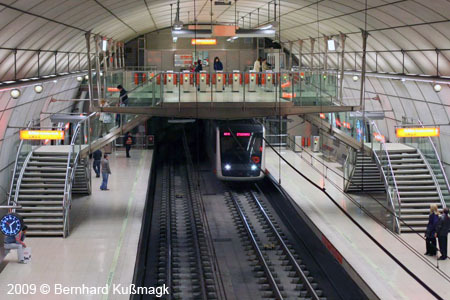 Robert Schwandl: METROS IN SPAIN. 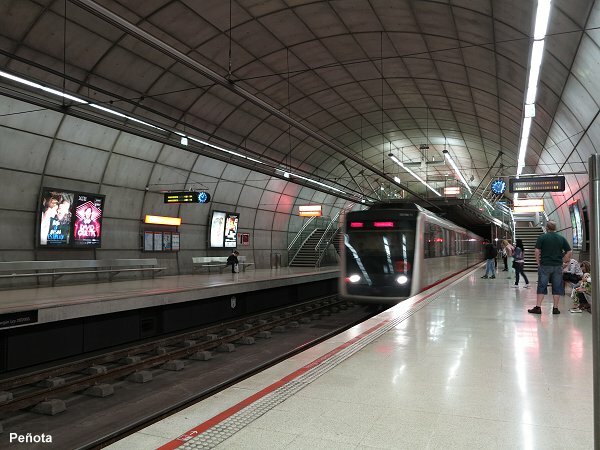 The Underground Railways of Madrid, Barcelona, Valencia and Bilbao. Renfe (Spanish National Railways) operates three suburban lines from the centre of Bilbao. 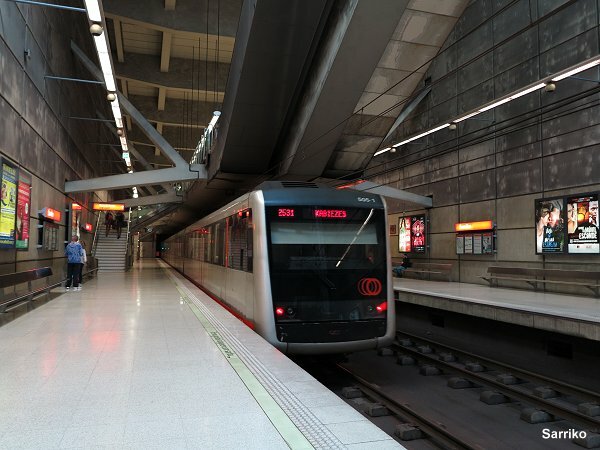 Until March 4, 1999 the Muskiz and Santurtzi lines terminated at La Naja which is quite close to Abando, Bilbao's Central Station, but no through service was possible. 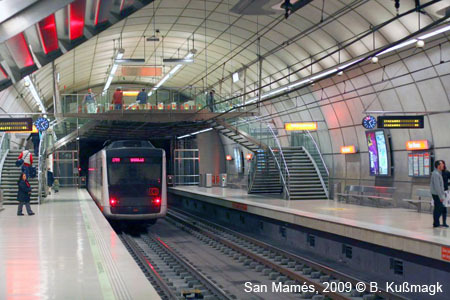 Therefore a former connecting line between Olabeaga and Abando has been rebuilt to connect the two northern lines (Muskiz and Santurtzi lines) to the southern line to Orduña thus creating also a new multifunctional transfer station at San Mamés (Metro and TermiBus), a joint station with Feve at Ametzola and two new intermediate stations at Autonomía and Zabalburu. Around Autonomía and Ametzola the old line was covered to create new avenues. As Abando is a terminus station, passengers have to change trains here to continue. With this new line in operation, the former connection along the river Nervión between Olabeaga and La Naja via Parke-Guggenheim was dismantled to allow for the finishing of the new development area Abandoibarra between the Guggenheim Museum and the new Euskalduna Congress and Concert Hall. Instead a tram line from San Mamés via Abandoibarra along the river to the city centre at Arriaga Theatre and further on to Atxuri (EuskoTren Station) was built. On 25 January 2005, La Peña station was added on line C-3 to Ollargan, followed by the 50m deep station Miribilla on 18 Dec 2008. 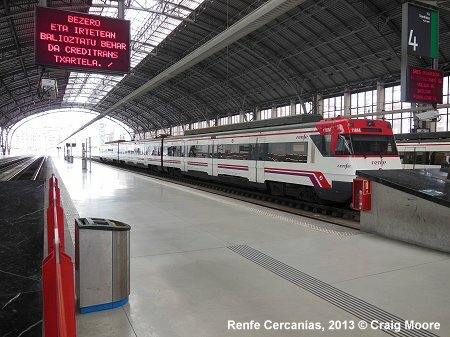 FEVE (Ferrocarriles de Vía Estrecha - Narrow Gauge Railways - now integrated into Renfe) operates some narrow gauge lines along the Spanish northern coast (for example Bilbao - Santander - Oviedo). 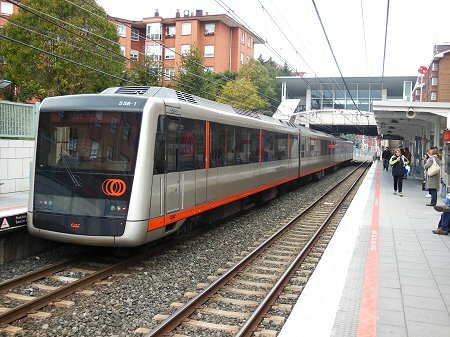 One branch is operated as a suburban service from Bilbao to Balmaseda with a 30-minute headway with 4 stations in the built-up metropolitan area of Bilbao (Bilbao station which is situated close to Abando, Ametzola, Basurto-Hospital and Zorrotza). 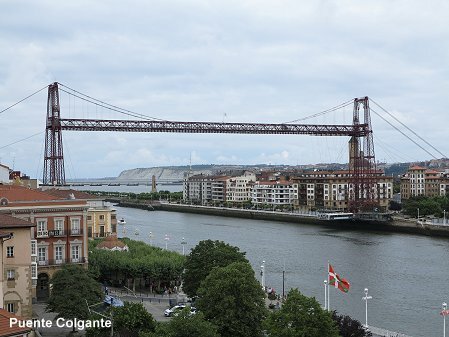 Another very special means of transport in the Greater Bilbao area is the Transporter Bridge between Portugalete and Areeta (Las Arenas). It's over 100 years old and transports people and cars across the river Nervión every few minutes. 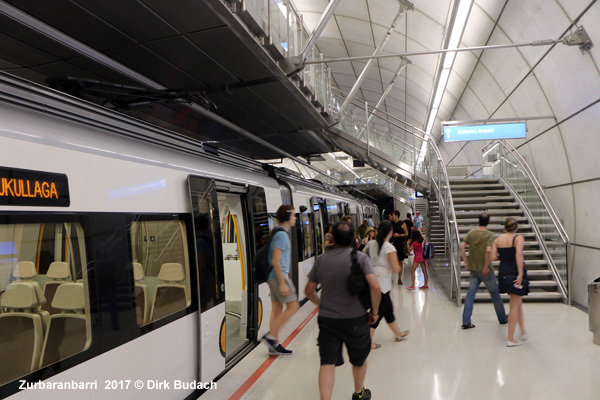 From Plaza del Funicular, near the new pedestrian bridge Zubizuri (White Bridge), this funicular takes you up the mountain of Artxanda from where you'll have a tremendous view over Bilbao and surroundings. The lower terminus lies below the now covered Matiko station.